Marketing is such a broad term that even marketing majors may not be particularly sure what they’ve signed up to do. You can’t really blame them though, depending on what you’re involved with there are a lot of things to do with your marketing degree. You may be producing content, researching, strategizing, or communicating with the public, based on how you want to specialize. With such a broad field of possibilities, it’s hard to know what to expect when you graduate. A lot of schools don’t even offer marketing programs. You might be studying journalism, communications, or even something like statistics. It all comes together in marketing, and here’s what you can expect from your entry level jobs, and how you can move up. 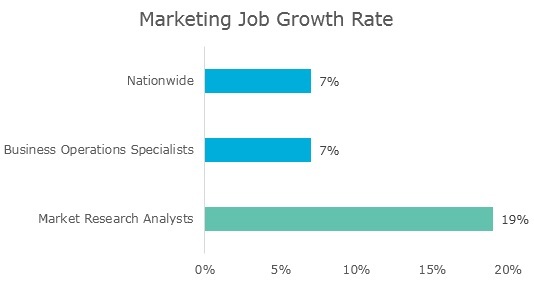 According to Payscale, the nationwide average salary for an entry level marketing analyst is $50,824, which is much higher than the nationwide average salary of $36,000. 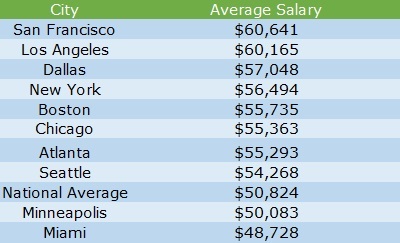 Naturally these salaries vary by location, San Francisco pays near 20% above the national average, but some areas, like Miami, pay below the $50,824 average. While this may seem obvious, the world of marketing is becoming increasingly data driven as we get more access to information about consumer behavior. 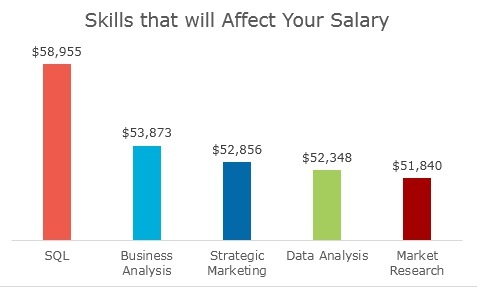 Marketing majors typically don’t have any coding experience, so any data experience you have can greatly affect your salary. For example, knowledge of SQL, a language used to communicate with databases to gather information, shows a 16% increase in salaries. 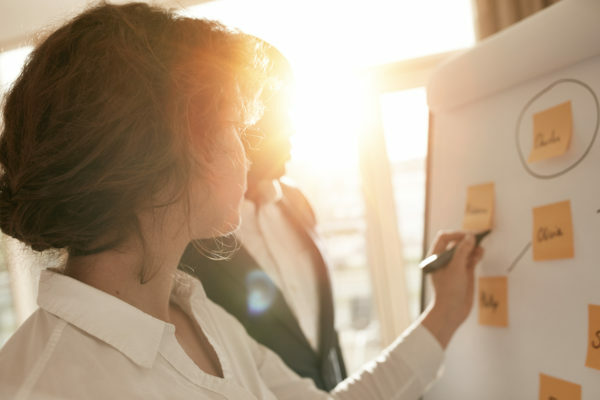 The Bureau of Labor Statistics estimates positions as market research analysts to grow from 495,500 to 587,800, or a 19% increase, between now and 2024. These positions are expected to grow due to the demand in those knowledgeable in data, so you might want to be familiar with a language such as SQL to keep up with job demand. Although positions as market research analysts don’t all require master’s degrees, setting yourself apart from the pack is a good idea. Check out our articles on getting a master’s degree here and here. Because everyone is starting to use data to better understand behaviors, not just businesses, marketing positions are available in nearly every sector. The fact that the largest sector of marketing employment only holds 10% of positions is a testament to this – all industries have marketing needs that need to be fulfilled. Nearly all of the top cities for employing market research analysts are on a coast – in fact 50% of the numbers listed below are in New York City, Washington D.C., or Boston. There are also plenty of opportunities on the west coast, but once moving inward there are less employers. 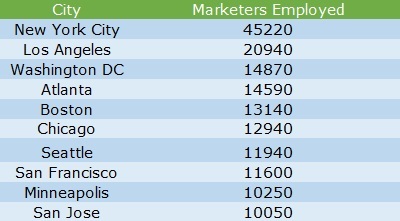 New York City employs the most marketing research analysts, with 45,220 in total. Looking for something else? Check out our guides on related fields – Advertising and Public Relations. Want for more career advice? TransparentCareer offers free data on compensation packages, salary negotiation, and career pathing. Sign up for a free account here!